Looking for the rank Jiralhanae Chieftain or Chieftain of the Jiralhanae, the rulers of the Jiralhanae? "Commanding troops requires both audacity and great strength." War Chieftain is one of the highest Jiralhanae ranks. Jiralhanae of this rank were commonly deployed during the final year of the Human-Covenant War, with War Chieftains playing a significant role in the Covenant's occupation of Earth and defense on Installation 00. War Chieftains are superior in rank to regular Jiralhanae Chieftains and are responsible for commanding much larger packs than Jiralhanae Chieftains. Despite this, War Chieftains are more often seen guarding smaller outposts. They are commonly commanders of Type-47B Scarabs, and always perform tasks with a crew featuring Jiralhanae exclusively. War Chieftains should not be confused with the Chieftain of the Jiralhanae, though the Chieftain of the Jiralhanae likely also holds the rank of War Chieftain. The Chieftain of the Jiralhanae is the leader of the entire Jiralhanae race in service of the Covenant. Instead of the red-and-black armor of a regular Chieftain, a War Chieftain wears a golden-bronze suit with slightly more powerful shields. Their head crests are also more ornate, with a larger forehead spike featuring a split "V" shape with jagged spikes lining the edges, and a smaller "V" further forward on the helmet. This makes the War Chieftains more recognizable and intimidating in battle. Most War Chieftains carry powerful ranged weapons, as they prefer to inflict maximum damage upon their enemies while reinforcing their physical superiority to other Jiralhanae. Weapons commonly wielded by War Chieftains include Type-33 fuel rod guns and Type-52 plasma cannons, rather than the Type-2 gravity hammers carried by the lower ranked Chieftains. War Chieftains usually carry plasma cannons or fuel rod guns into battle and use spikers as sidearms, striking their enemies from afar while their subordinates close in and engage. This gives them considerable ability to suppress their enemies, allowing their own forces to move freely. If within range, they will often deploy a power drain to eliminate the player's shields. They may also throw a flare to blind their opponents, and can use their weapons to devastating effect while their opponents are unable to see. 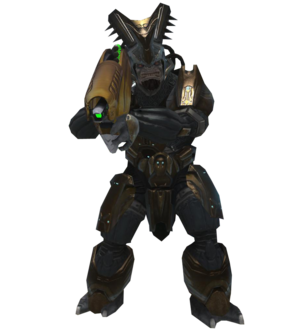 War Chieftains are the only NPCs in Halo 3 (other than the Arbiter in the Halo 3 single-player campaign) that can melee with a plasma cannon without dropping it. There have been some instances where a War Chieftain goes berserk, enabling it to leap great distances and kill John-117 in a single blow. On Heroic difficulty, it takes approximately fifty-five assault rifle rounds to kill a War Chieftain: twelve rounds to disable their shield, and an additional forty-three rounds to kill them. A shielded War Chieftain takes six particle beam rifle, SRS99D-S2 AM sniper rifle, or Brute shot hits to kill. While their shield can be dropped with only eight plasma rifle bolts or a single overcharged plasma pistol shot, their special power armor grants them unusually high resistance to energy weaponry, and even unshielded, they can withstand more than two hundred Plasma Rifle bolts before falling. It takes two gravity hammer hits to kill them as well. It is advised that the player use long-range weapons against a War Chieftain, such as the battle rifle or sniper rifle. Use cover effectively and fire accurate shots to knock their helmet off. Meleeing it will cause it to stagger, simply allowing you to bludgeon it to death with melee attacks without having to worry about it counter-attacking you if you are quick enough. It is also possible to kill one quickly by meleeing it, and then circling for an assassination as long as he doesn't backhand the player with the weapon the first chance he gets. Firebombs are a good way to kill a War Chieftain, and if you can stick it on its weapon, a plasma or spike grenade will do. Note that only their weapon can be stuck, and not their armor. On Legendary, sticking is not a guaranteed one-hit kill. You can still follow up with a headshot using a battle rifle or Covenant carbine or a quick melee to take them down. In Halo 3: ODST, however, War Chieftains sometimes wield gravity hammers, making them some of the most powerful enemies in the game, as they have stronger shielding and are higher ranked than regular Jiralhanae Chieftains. In Halo 3, War Chieftains are known to go berserk when a power drain is next to them for some odd reason. Leave the Chieftain alone for long enough and it will turn back to normal. In the last page of Halo 3: The Official Strategy Guide, it shows a War Chieftain holding a gravity hammer, though this was never seen in-game until Halo 3: ODST. In the video Et Tu Brute?, a War Chieftain is seen with a portable Type-42 plasma cannon. This could be because at the time the video was made, the Type-52 plasma cannon had not been developed yet. The picture of the War Chieftain in the Bestiarum is actually a picture of a Jiralhanae that was scrapped and redesigned in Halo 3's early stages of development. A War Chieftain in the Bestiarum. A War Chieftain overseeing a small encampment. A War Chieftain armed with a plasma cannon. A War Chieftain shooting a plasma cannon. A War Chieftain (right) standing near a Jiralhanae Chieftain. A War Chieftain armed with a gravity hammer. A War Chieftain aiming his fuel rod cannon in Halo 3: ODST's Firefight play-mode. A close-up view of the War Chieftain's unique headdress (outlined by an ODST's VISR mode), which designates its rank and intimidates allies and enemies alike.